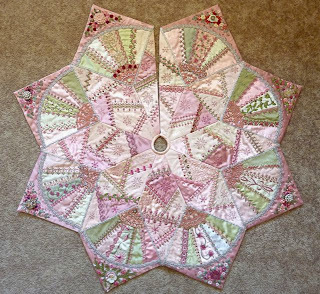 Susie started this tree skirt as her CQJP2012 project, and I'm so proud of her for finishing it...and it is GORGEOUS! You may have seen photos of it in Pat Winter's magazine...but I asked if I could share the photos that Susie sent to CQJP as her finish here too. If you missed her blocks, you can find them posted on the CQJP2012 blog. In celebration of her pink skirt (to match her beautiful pink Christmas tree) she just had to have one of my pink spiders too. And although it is too large to work as a CQ spider...it will still find a special home on or under her christmas tree. Now, doesn't this spider just look so proud to be walking on this gorgous tree skirt!? I think so!! Super great job Susie!! I owe many Thank You's to you along with a great big hug! Yes indeed your beautimous spider found her home on the tree skirt and will bring me her traditional 'good luck' all year long. My biggest "thanks" is for your idea of the CQJP. It has given me so many opportunities for learning, making friends, stretching my creativity and finally this beautiful finished tree skirt. I can honestly tell everyone to join in the program .... you will be amazed at what you can do. 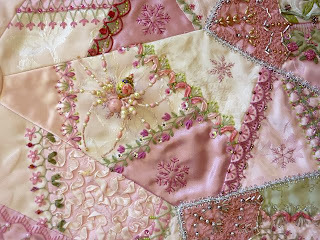 A pink tree, a pink tree skirt and a pink spider?! It doesn't get any better (or pinker!) than that. Kudos to you both.